GH-28 : GALAXIAN THEATER for 28 players !!! Dragon's Lair Fans - Arcade Lifestyle > General Chat > Galaxian Theater > GH-28 : GALAXIAN THEATER for 28 players !!! 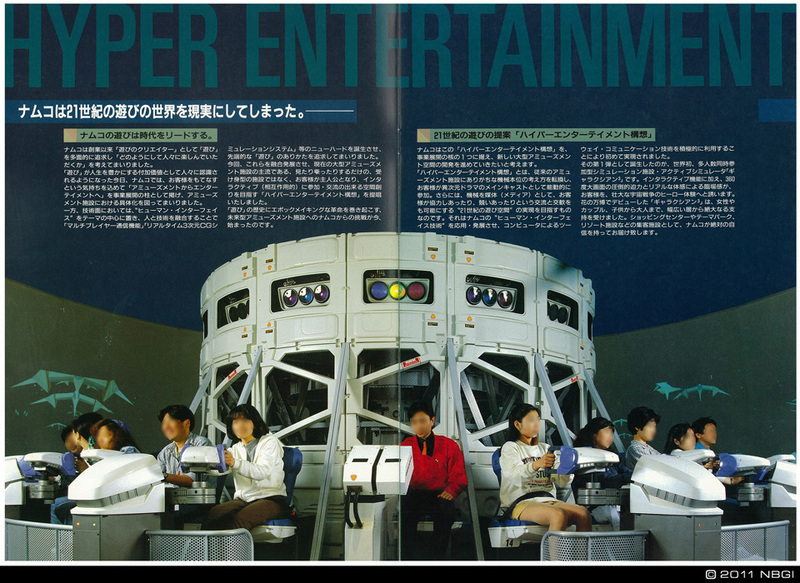 Re: GH-28 : GALAXIAN THEATER for 28 players !!! Wow! That thing is huge!! Would love to play this one day! I'm waiting for Scr33n to make a replica. 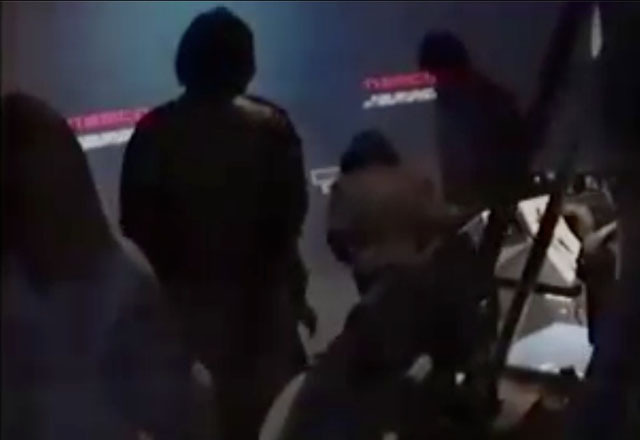 Don't miss the end of the video, when the players are exiting the 'theater' ... can you spot the 'row' of Starblade? How many Driver's Eyes can you see? Great job you're doing there nuno. I am just so grateful for you and our japanese members here on the forum, for your dedication and sharing all that info about these fantastic giant attractions, which I would have totally missed out on if it weren't for you guys. Being located high up in Europe's northern, colder, regions I never had the opportunity to actually try either of these large 'space shooting theaters'. 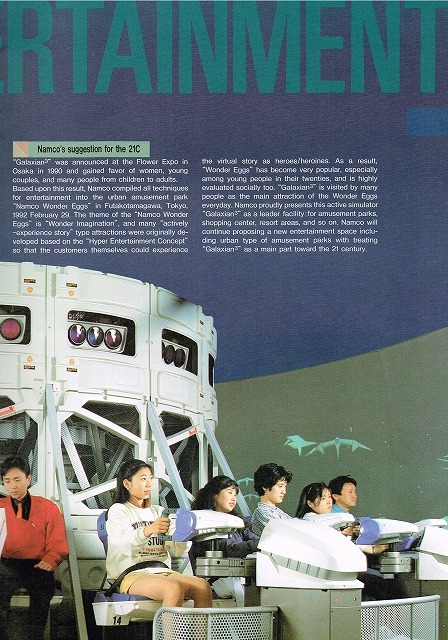 I once encountered the smaller 4-player Galaxian3 on a holiday in Paris, but it had the background scenery missing. 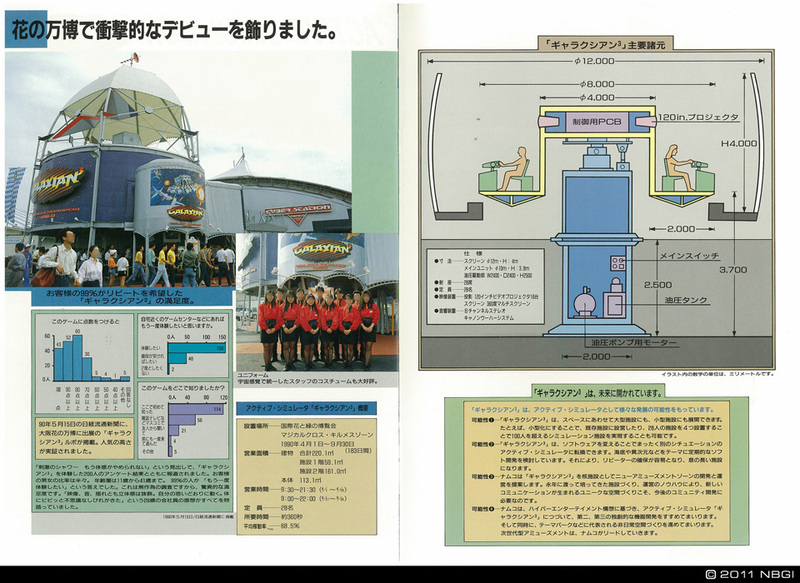 I once encountered the smaller 4-player Galaxian3 on a holiday in Paris, but it had the background scenery missing. 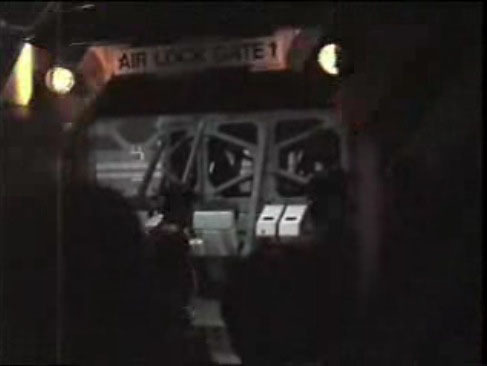 Here's a new video, quite interesting because it has been shoot in one take, from the briefing room to the air lock game, to the entrance, and finally to the exit...in one take! Super clip, thanks! I love the pilot's gloves, three different watches integrated in his glove there. 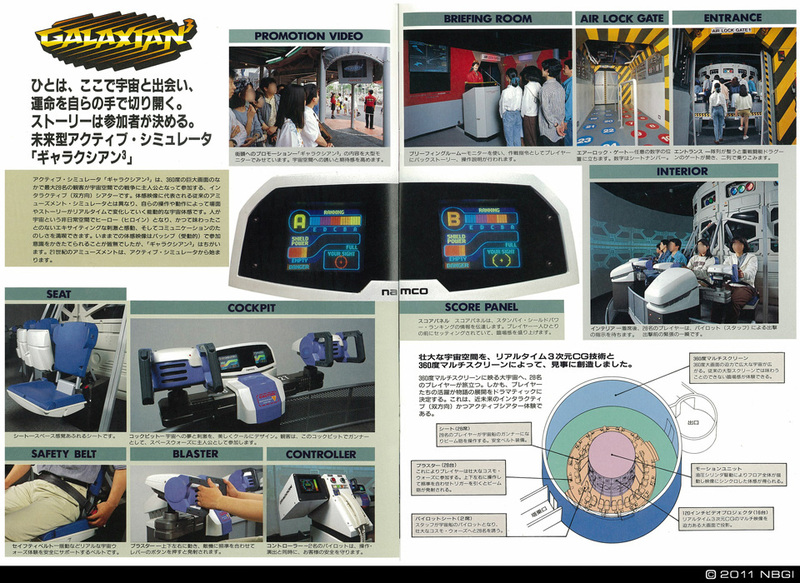 About the "4-player Galaxian3", I am positive that it wasn't the original konfiguration. But there were only four seats and four guns. Also the entrance I think was a bit modified because there was only one, not two. I guess that they had rebuilt it to fit in the smaller location. I remember that I was very thrilled about it, seeing it almost directly as I entered the arcade. But when I noticed that the background graphics wasn't there I understood that it wasn't fully functional. 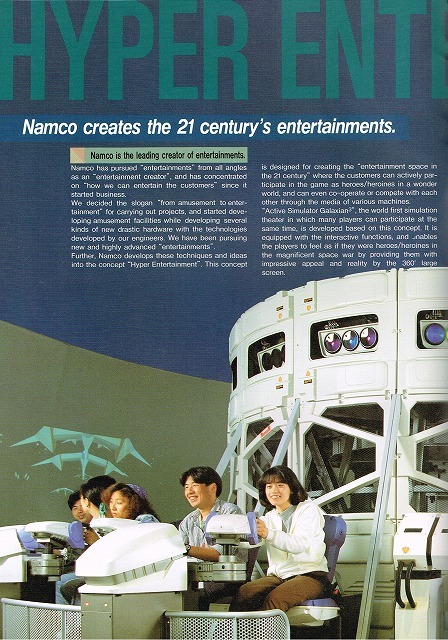 Wow, namco must have spent some on the luxury inside the G3 28-player theatre. I just noticed you have these small indicator screen with 'power', 'shield' and stuff displayed next to your gun at each station. But what I gather from the video the total game play is only around 3 minutes, that's excluding any instructions and end credits. Is this correct? 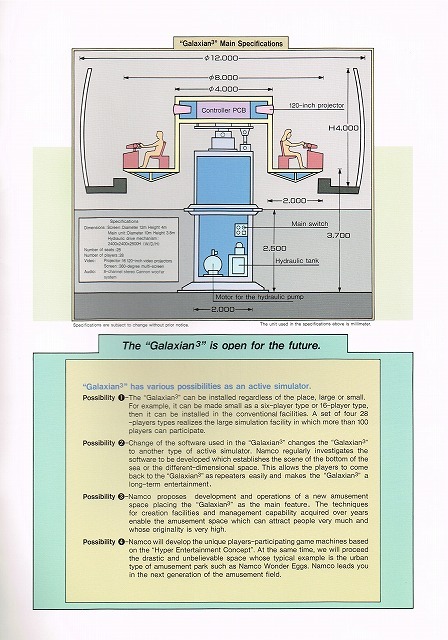 So based on these physical facts, all players sit in the 'space ship' which is equiped with a multi-gunner (circular shaped) gun-tower .. sort of? Also, I notice that the 28-player theathre has only flat shaded, non-textured polygons. 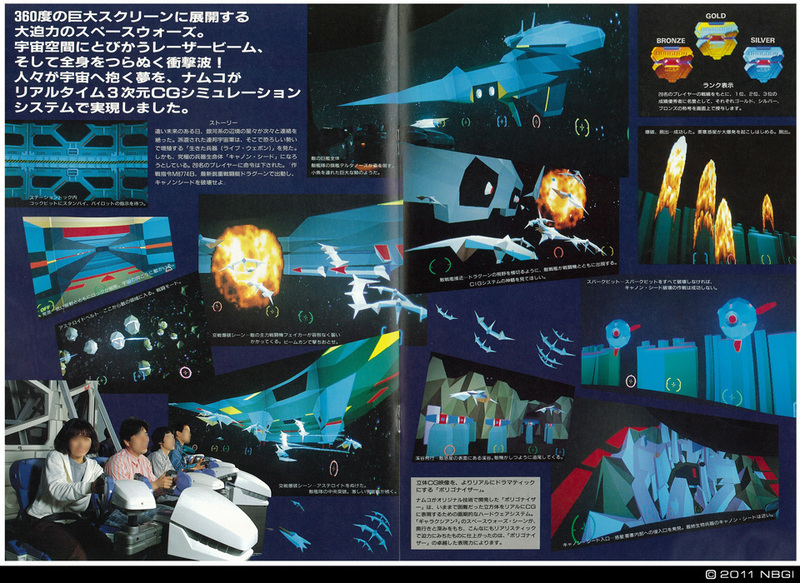 Now I am inspecting the flyer again, and it seems like a mega-version of Starblade. 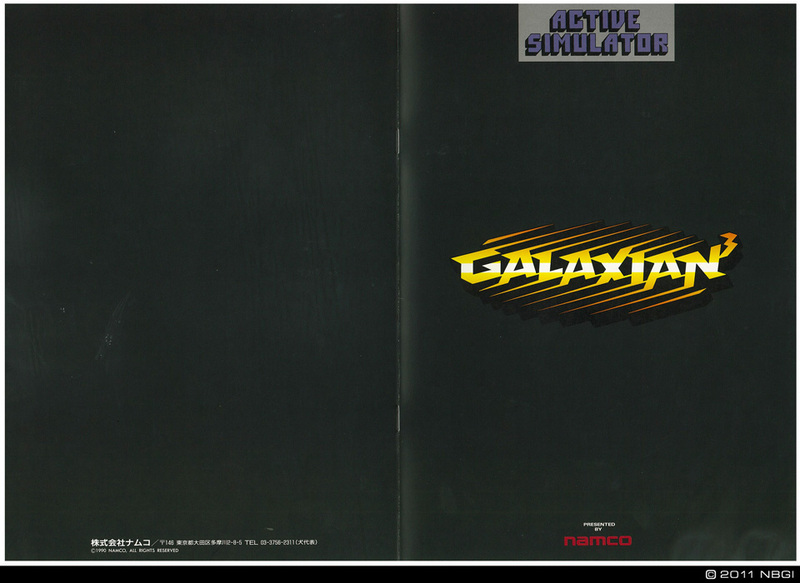 Not Galaxian³ at all, but rather 99% Starblade. 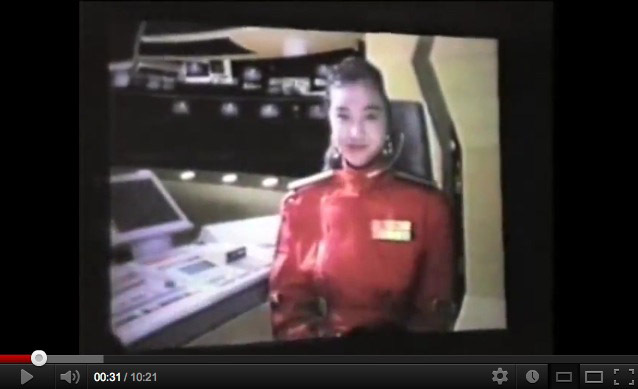 And, watching the clip I can see only what seems to be real-time rendered plygons. Both small targets and larger enemy flag ships are flat shaded polygons. And the planet explosion at the end is also very much like in Starblade. 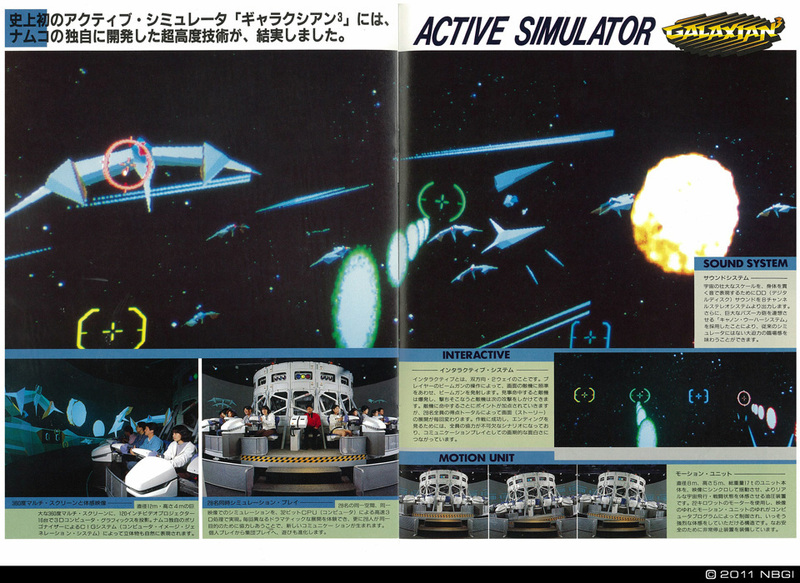 Shouldn't the 28-player theatre infact be called "Starblade 28-player theatre" instead of "Galaxian³"? 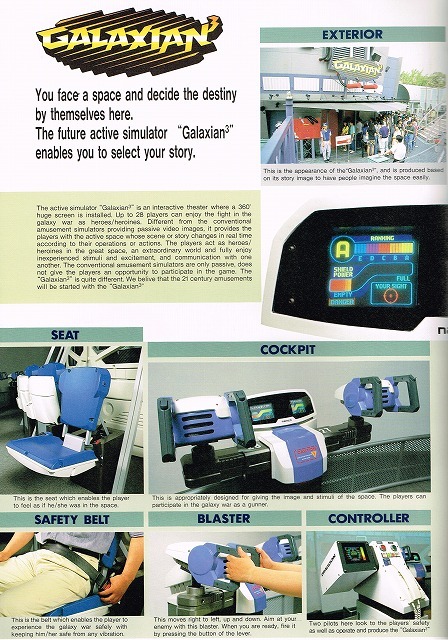 Or, to be correct, perhaps the large theatre should be called Starblade, and what was released as "Starblade" in 1992 should infact be "Starblade - single player version", or simply "Starblade: Geosword"? ...that includes the briefing room and a full game. Note the difference between the GH28 : the game briefing this time is completely presented on a video... no human like the GH28. Found the 'press kit version' pictures on this Japanese blog, and ... in english! I tried to found how to contact the blog owner for asking him where he got that US version of the flyer/press kit and request bigger pictures if possible... but I cannot figure out how to send him a mail (it's possible to send him a comment via his blog, but there's a picture check (written in Japanese) to confirm I cannot input Anyone speaking Japanese to help me for contacting him?